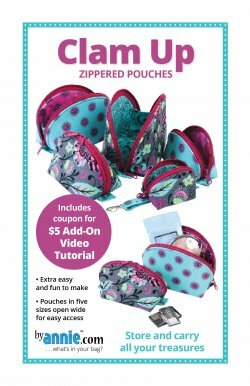 The pattern includes complete step-by-step instructions for making the bags with or without quilted fabric and for adding optional iron-on vinyl laminate to make the inside easy to wipe clean. Double-slide zippers and handy grab tabs make the bags easy to open wide and attached side panels prevent contents from falling out. An optional strap with swivel hook may also be added. When empty, the bags nest inside one another to save space. Clam Up Pattern $10.00. Pre-quilt and pre-cut all pattern pieces for medium size pouch.